So you’ve probably heard the phrase: “Work ON Your Business, Not Just In It.” But many business leaders struggle with finding a solid compass by which to know if they are actually improving their business, or just throwing spaghetti against a wall trying one fad or another. So as captains of old used the North Star to know if they were going the right direction, so you can use SIMPLICITY to know if you are actually making real progress. How many steps does it take for a customer to find and order a product or interact with you? How reports and people do you have to collect to get a complete snapshot of your business (ROI, P&L, Trends, Job Queue, Accounts Receivable, etc.)? How much time is lost in your business due to confusion and miscommunication? How much time does it take and how difficult is it to communicate with all your customers? What is your ratio of management/administration to production, or how many managers do you have per productive employee? How much time and manpower is spent tracking and ordering inventory? How much time does it take to investigate an issue if a client has a problem? How easily can your current and potential customers articulate your value? How easily can your sales people effectively articulate your value? How much time does it take to manage your sales process? These are all things which drain time, resources, and energy which can all be overcome with process improvement, technology strategies, and thought-out messaging. 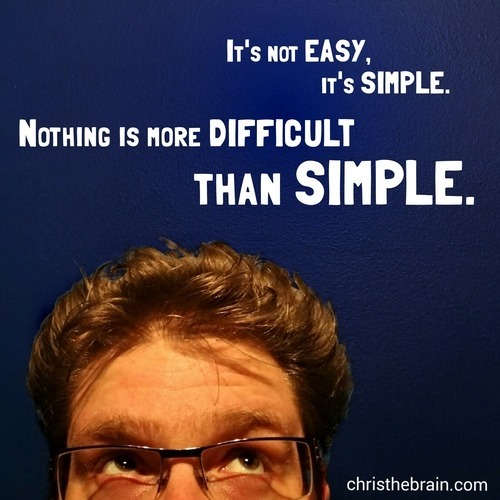 It is a “no-brainer” to draw a line between simplicity and the bottom line. If you can run your business in less time, you can make more money. If your customers can access great products, service, and support quickly and effectively, they are more likely to buy more and evangelise their experience. To many business leaders brush off complexity as inherent to their business, as if they are helpless and can’t do anything about it. “Well sure, that’s easy for THAT company, but we are different, our business is harder.” Let me tell you something, simplicity isn’t easy, it’s just simple. Nothing is harder than simple. Like watching an Olympic gymnast, they make it LOOK easy. Companies who have simple and streamlined services and products are not “lucky” or “have it easy,” they are probably working harder than you. When things are complicated, they are very hard to change. In today’s world, businesses often live or die on their ability to pivot. If everything is complicated and bloated in your business, then you are a sitting duck. Simplicity means agility. The ability to move a whole organization quickly and in-sync is vital to adapt to market changes. If you want your business to grow, focus on simple. Evaluate your progress by how much time you are taking out of tasks, how many steps you are eliminating, and how much information you are making accessible and automated. It’s like going to the gym, it’s slow but it always pays off if you keep it up.